These easy campfire treats are fun to make and eat! Fire cooked dough, stuffed with pudding and topped with frosting just can't be beat! Posted by Melissa at 8/29/2014 09:27:00 AM 0 Yumm's!!! Welcome to week 19 of the Cook it! Craft it! Share it! Link Party! I'm so glad you're joining us today! Last week we had 258 links! Thanks to everyone who linked up. Your recipes and craft ideas are fantastic! Posted by Melissa at 8/27/2014 08:30:00 PM 0 Yumm's!!! As a working mom, sometimes I find it hard to put a healthy meal on the table! Do you ever struggle with that? Picking up a pizza on the way home is so much easier! I try not to take that route too often, so in place of take out, I look for easy options for dinner at home. Posted by Melissa at 8/27/2014 09:49:00 AM 0 Yumm's!!! Chicken on a beer can...how many jokes can you come up with about that one? Well this is no joke, this grilled chicken is out-of-this-world delicious! Posted by Melissa at 8/25/2014 10:08:00 AM 0 Yumm's!!! This delicious sauce is made with fresh blackberries and has so many uses! Posted by Melissa at 8/22/2014 08:57:00 AM 0 Yumm's!!! Welcome to week 18 of the Cook it! Craft it! Share it! Link Party! I'm so glad you're joining us today! Last week we had 159 links! Thanks to everyone who linked up. Your Back to School ideas were fantastic! Posted by Melissa at 8/20/2014 08:30:00 PM 0 Yumm's!!! This simple and delicious Zucchini Cake is a great way to use up an abundance of zucchini from your garden. Posted by Melissa at 8/18/2014 12:00:00 AM 5 Yumm's!!! It's Wednesday! And you know what that means, right? Time to party!!! Welcome to week 17 of the Cook it! Craft it! Share it! Link Party! I'm so glad you're joining us today! Last week was our biggest week yet; we had 216 links! Let's make this week's party even bigger...so spread the word to your friends! Posted by Melissa at 8/13/2014 08:30:00 PM 0 Yumm's!!! I'm posting over at Juggling Act Mama again today; please stop over to say hi! Posted by Melissa at 8/12/2014 08:00:00 AM 0 Yumm's!!! Refreshing, delicious, and healthy too! These Watermelon Popsicles are the perfect summer treat! Posted by Melissa at 8/11/2014 08:57:00 AM 3 Yumm's!!! Welcome to Cook it! Craft it! Share it! 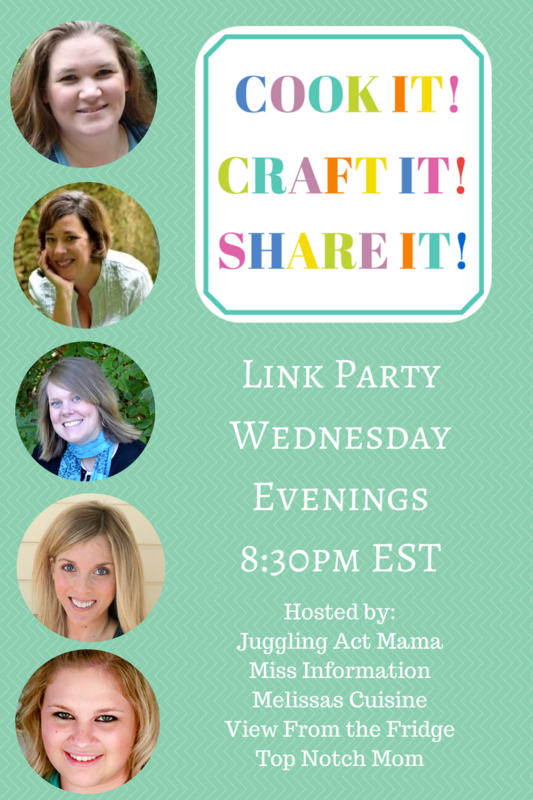 Link Party #16! This is a special week because it's my first week as a co-host and we're so happy to have new and old friends join us! This link party is dedicated to showing off all the awesome things you've cooked, baked, and crafted in the last week. If you made it, we want to see it! We're so glad to have each and everyone one of you here! Let's get started, shall we? this week we're excited to introduce to you our newest hostess, Melissa from MELISSA'S CUISINE!!! Posted by Melissa at 8/06/2014 08:30:00 PM 0 Yumm's!!! Grilled summer vegetables with buffalo chicken and quinoa come together in this delicious and healthy salad. Posted by Melissa at 8/04/2014 08:24:00 AM 0 Yumm's!!! Ready To Eat Cookie Dough...your cookie dough wishes just came true! Posted by Melissa at 8/01/2014 09:55:00 AM 0 Yumm's!! !